Why am I not surprised that a leading Hollywood director is bemoaning poor, misunderstood Adolf's place in history? Oliver Stone says his upcoming Showtime documentary series Secret History of America will put the 20th century's star butchers Adolf Hitler and Joseph Stalin "in context." That Hollywood would glorify Stalin is hardly a shock to anyone. If you go back to many Cold War-era movies, you will find tortured excuses — even fulsome praise — for Mother Russia. Only Nazi Germany was allowed to appear on the screen as evil incarnate. For decades, Hitler has been the perfect role model as villain — right out of "central casting." The highest-priced Hollywood talent scout could not have given the movie moguls a better gift. Funny mustache, silly goose-step, the "Sieg Heil" salutes, a "Master Race" theory, his evil shouting speeches. And that's before we even learned about the gas chambers and the Holocaust. Stalin was smarter about his evil. He murdered millions — but — he did not shout himself hoarse in public. He kept his mouth shut, and just did it. A good Hollywood producer can't do as much with that. 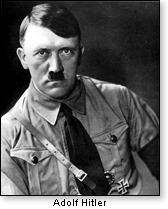 Hitler, by contrast, was in the world's face as he committed mass murder. 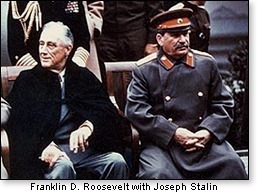 While Der Fuehrer's endless oratory was a worldwide turnoff, Stalin earned the "Good Old Joe" and "Uncle Joe" accolades from two U.S. presidents (Roosevelt and Truman), as he sat serenely puffing his pipe while virtually allowing his sucker allies to beg him to accept their offers of half of Europe and ultimately much of Asia. Old "Uncle Joe" was rather diminutive — reserved — politely, but with a steely will — insisting on the right to pick up where Hitler left off in gobbling up the smorgasbord of territory all over the landscape. So for decades, as we underwent a Cold War life-and-death struggle with Stalin and his successors, Hollywood treated us to a half-century of goose-stepping Nazis whose ideology was effectively entombed after Hitler shot himself in the bunker. 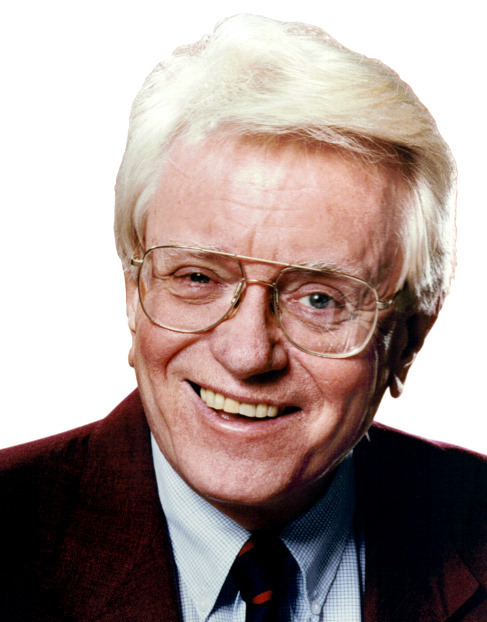 All the while, some of the most prominent Hollywood types actually had an affinity for Soviet communism. All of which provides a perfect segue into the book America's 30-Years War. 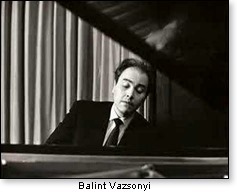 The 1998 tome was authored by the late concert pianist Balint Vazsonyi, a Hungarian-American who lived under both Hitler and Stalin in his native land. In fact, as Soviet tanks rolled into Budapest in 1956, Vazsonyi was among the street fighters resisting the tanks with little more than their bare hands and some well-placed but inadequate bricks. From this up-front view, Vazsonyi concluded that Communism (red) and Nazism (brown) were just different brands of socialism (yes, the official name of the Nazi party was the National Socialist German Workers Party). "Communist operatives worked out of the same buildings occupied not long before by the Gestapo and wore the same shining leather jackets as the Nazis," Vazsonyi wrote. Not surprisingly, some people hauled into those buildings quickly disappeared, never to be heard from again. Some saw Nazism as "socialism for anti-Semites." Even that doesn't quite draw the clear distinction. As the author reminds us, "Forgotten were the Russian pogroms, forgotten was Stalin's own rabid anti-Semitism" (Recall the fate of the "Jewish doctors" under Stalin). "Reactionary," "exploitation," "oppressor," and "oppressed" were some of the words taken straight from the Marxist repertoire, Vazsonyi observed. Further, he adds "The term 'politically correct' first came to my attention through the writings of Anton Semionovich Makarenko, Lenin's expert on education. Adolf Hitler preferred the version 'socially correct.'" "Then came the affirmative action forms which classified people by ancestry — first signed into law in Nazi Germany — and the preferential treatment of specific categories, introduced by the Stalinist government [in Hungary] in 1950." In a report for Accuracy in Media, we learn of Hitler's Green Killing Machine (See AIM Report — 2/15/10), and that "sweeping Nazi environmental laws, all signed by Hitler and considered his pet projects...reflected the fact that Nazi racism was rooted in ecology." The recent AIM report was authored by Mark Musser, a missionary to the former Soviet Union who is now a pastor and author of Nazi Oaks: The Green Sacrificial Offering of the Judeo-Christian Worldview in the Holocaust. In Hitler's mind, his "Master Race" was at war with the industrial age, which he scorned for "its emphasis upon commercialism, city life, international trade and finance." He believed these "were corrupting the biological substance of the German people." The Jews bore a large part of the brunt of that in "The Final Solution." By 1935, writes Musser, "Nazi Germany was the greenest regime on the planet." "The Animal Protection laws" would soon follow. And this: "The Reich Nature Protection Act even allowed the expropriation of private property without compensation for the sake of the environment. Sustainable forestry practices called Dauerwald, which ironically means 'eternal' forest, were also introduced." "Along these radical lines," according to Musser, "is that both Hitler and [Heinrich] Himmler apparently had plans to make Germany vegan after the war." As Balint Vazsonyi observed, when Hitler was fighting both the Jews and the Soviets at the same time, scores of authors, musicians, and other prominent figures added 2 plus 2 and got 3. That last part was my wording — interpreting Vazsonyi's point that this was a case of "the enemy of my enemy is my friend" gone off the charts. This writer once proposed to Vazsonyi that he organize a Communist-hunting version of the Nazi-hunting Simon Wiesenthal Center. The Hungarian native opined that the former presented problems not evident in the latter. Old Nazi war criminals were hunkered down as the retired factory worker in Ohio or the housewife in Queens. Old Communist-aiders and abettors, on the other hand, held lofty positions as part of the establishment (or what Angelo M. Codevilla would today identify as a segment of "the ruling class"). Author Vazsonyi notes their causes include wealth redistribution, "free" health care, and environmental "justice." Like it or not, the word for that agenda is communism (Nazism now being operationally defunct). From his grave, Vazsonyi warns, "[All] those who believe that socialism has merit and is intellectually acceptable, but communism is abhorrent and out of the question, are fooling themselves."